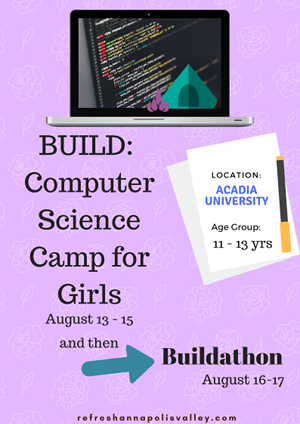 BUILD is a week long dive into the world of Computer Science for girls 11 to 13. We will explore the basics of software development while building interactive artwork and stories, video games, and software that interacts with the physical world. Through our exploration we will also journey through use of hardware, refine our ideation skills and turn our ideas into software. Campers will also connect with Computer Scientists in our community who are changing the world one algorithm at a time. BUILD will start at 9:00 AM, with an early drop off at 8:30. Pickup will be from 4:30 to 5:00PM. Each day will focus on building new skills and applying knowledge to a unique camper project. Camp will take place on the Acadia University campus. A combination of in class and outdoor activities will make up the camper’s day. Parents, take a break. We can provide lunch for campers too. Just ship ‘em off with a snack. The camp is capped at 20 girls aged 11 to 13. The suggested cost for the camp is $130 per camper, or $180 including lunch. We realize that this fee will not scale to meet everyone’s budget and will provide financial assistance as needed. Campers will also need to bring a laptop to each class. The laptop needs to be able to run a modern web browser such as Google Chrome. A mouse is also highly recommended. Laptops are available for girls who do not have access to their own. To register, fill out the below form, or open the registration form directly. Big tip of the hat to the Acadia Entrepreneurship Centre for hosting our class.